There's not much the US can do in a post-Saddam Middle East except practice containment (and keep up airpower)—another invasion of foreign occupiers will only drive yet more legitimacy to Daesh. 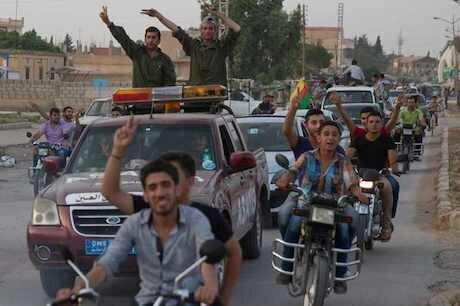 Kurd fighters and residents celebrate capture of Mabrouka from ISIS. Björn Kietzmann/Demotix. All rights reserved. There has been much ado about Obama’s responsibility for failures in Iraq. How could a decade-long campaign to overthrow a tyrant and impose democracy have possibly gone wrong? The irony is that in populist and capricious US domestic politics those of the Bush administration have always been referred to as “neo-conservatives”. Of course, democracy is liberalism. To impose democracy is “neo-liberalism” by definition; a moniker to which the former administration and their followers would bristle for its insinuation at Carter-esque weakness and gentility. However, this liberalism, imbued with platonic notions of good and evil floating in space, and the irrational theism that we are being teleologically drawn to a place of social perfection where insecurity will be eradicated, has skewed US foreign policy for these many long years since the first stymied attempts at placating a Korean Peninsula at war, or before. Iraq’s problems are manifold, but that has not filtered through the media narrative and the popularly-held notion of monoliths; the communist monolith that proved to be as fractured as Asia has always been, and now Daesh (the organization will be referred to here with the Arabic acronym, not “ISIS, ISIL, or IS,” as to do so is to both render de facto recognition as a legitimate state, and as a religious authority). In the early days after the fall of Mosul, Arab press and western think tanks reported on the 82 different armed groups that comprised Daesh; some Islamist, some Ba’athist, but largely Sunni-Arab tribes. Yet the calls for moderation fell on deaf ears as both left and right media outlets stuck to their narratives of Islamism as monolith. Memes swept across social media of whole swathes of Asia and Africa painted in black with white Arabic script scrawled across. The rise of Daesh, put simply, is a Sunni-Arab nationalism movement instigated by the anti-Sunni rule of a Bush-imposed and Tehran-backed Shi’a-Arab Iraqi administration (al-Maliki, and his appointed successor al-Abadi), as well as feelings within the Sunni-Arab community of being isolated by Shi’a Baghdad, and being organized by former Ba’athists, using the veneer of religious righteousness and identity. Iraq as a modern state has been a vestige of the immediate post-colonial period, and only held together for decades by force. That autocrat having been removed, there should be no illusions as to why a developing country nearly the size of Texas, surviving decades of war, and made up of three blocs whom historically loathe each other (Sunni-Arab, Shi’a-Arab, Sunni-Kurd), should break into factions. If it weren’t for Syria, Daesh, and the US’ very public misconception that invasion could somehow beget peace, would anyone really care if another developing country shook off the shackles of its colonial-era balkanized borders? Unfortunately the age old principle of “you break it, you buy it” squarely collides with harsh questions on what can practically be accomplished. Firstly, landing foreign infidel fighters will likely do more harm than good. This is a nationalist movement. Ergo, non-nationals are largely not welcome, at least to many of the religiously conservative Sunni-Arab tribes whom Baghdad needs to invite to turn against their current Daesh-Ba’athist benefactors. This issue also affects the Shi’a militias, showing greater competency in recent battles than the Iraqi Army (IA), but unwelcome in Sunni homelands. Secondly, accusations of cowardice against the IA may not be universally logical. When you are a field commander, from another tribe and another area, and you are left without supplies and ammunition to protect and defend a random piece of land, why would you stand and die? The IA has struggled to restructure from its pseudo-tribal bureaucracy, where administrative cronyism and ostensible hoarding of material (Arabic speakers have a word for influence and clout in this capacity: wasta) have failed to yield to a more network oriented military apparatus, moving assets where needed, and quickly. Furthermore, and more broadly, the IA has failed to develop a sense of mission and purpose, as a regular army might fail to identify with a fractured state, whereas sectarian-fueled militias have their respective missions. These IA reforms have not been possible with a US benefactor waiting in the wings. It can be argued that true existential anxiety must permeate Baghdad's political-military complex before reform in these areas can be accomplished. This reality dovetails with the broader Sunni-Shi’a conflict of the region, and an increasing need to incorporate Iran. In addition to holding de facto control or influence over Shi’a-Arab militias in Iraq, Iran’s cooperation would also be advantageous in international talks with the Alawite Shi’a Assad regime in Syria. Strategically, if Daesh is defeatable as a unifying organization in the region, it will not be until their Iraq-Syria cross-border advantage is closed, the western front of the Daesh conflict contained, and a veritable pincer move placed on the insurgency. Iran facilitating talks with Assad will be imperative to bringing the regime’s assets, Iranian al-Quds, and Hezbollah (Iran’s irregular proxy) into cooperation with the IA ground forces, Iraqi Shi’a-Arab militias, and the coalition air campaign—if the US and western partners can see past decades of bad blood with their Persian adversaries. A credible partner in the north has been the Sunni-Kurdish semi-autonomous region of Iraq (Kurdistan). Calls to arm the Kurdistan regular army ('Peshmerga', literally “those who face death”; also, less formally, a ubiquitous term for irregular Kurdish partisans throughout the four contiguous regions) with heavy weapons for battle against Daesh’s northern Iraq presence have gone largely unanswered. But would further arming the Kurds beyond MRAPs and RPGs work, and what would be the fall-out? Often heralded as a model of pluralism and efficacious governance, Kurdistan suffers from deeply fractured linguistic (Sorani, Kurmanji, etc. ), tribal (Barzani, Talabani, etc. ), partisan, and religious (Sunni, Syriac, Yazidi, etc.) identities. After a civil war along tribal-partisan lines in the 1990s, old grievances still persist under a heavy-handed veneer of national identity. Only recently (June, 2015) KDPI (Iran) and PKK (Turkey) elements clashed in the remote Zagros Mountains at the border of Kurdish Iraq and Iran. And sitting Kurdistan president Masoud Barzani has already extended his term limits by two years in his current 10-year administration. Recent saber-rattling about another extension has subsided with pending elections in August 2015. However, whether Kurdistan can peacefully transfer power internally remains to be seen. Not unlike the IA, the Peshmerga is broken into PUK and KDP tribal-partisan divisions and has a material problem, the KDP traditionally hoarding equipment as they control most critical government posts. Furthermore, the Peshmerga are mountain fighters, and only 200 thousand strong. Leaving the slopes and heading into the Mosul plains would leave their competencies behind, and render Kurdistan vulnerable; especially seeing how a growing class divide and resentment at corruption has already led 500 Sunni-Kurds to leave ethno-nationalism behind and defect to Daesh. Furthermore, with oil deposits complicated but promising throughout Kurdistan, including a hotly contested border with Iraq proper (especially around the Kirkuk fields, and Jalawla where fighting between Peshmerga and Shi’a militias broke out recently), the US supplying Kurds with the weapons to not only fight each other but also Baghdad for secession would only drive Shi’a-Arab Baghdad away from the US and further into the hands of their fellow-Shi’a Tehran benefactors. This would only further alienate western interests, to say nothing of Turkish and Iranian objections to Kurdish heavy weapons let loose on their contiguous and porous borders. The US has not abandoned Kurdistan. The US simply does not want to invite further instability when Kurdistan is currently showing proficiency at maintaining a defended border. Nature abhors a vacuum, and so does international politics (as if human insecurity was, sadly, anything other than natural). Iranian expansionist ambitions have long antagonized the Gulf States, but now have a real foothold on the peninsula with the recent successes of the Zaydi-Shi’a Houthi rebels. Further Iranian adventurism has reared its head throughout the region and globally, by way of Hezbollah; even reportedly within the South American and African drug trade for the ostensible reason of sanction evasion, by use of illicit economies and captured state and financial structures abroad. But is Iran pursuing regional conquest to the point of total war, or merely doing what all realist countries do; pushing until pushed back? One of the driving narratives of US policy in Asia is Iran as an irrational actor. Iran clearly has a civil rights problem, notwithstanding subjective religious and historical contexts, and a ruling elite that is more of an oil cartel. But are they irrational? Iran’s power structures are deeply entrenched and redundant, and the poor, rural populace locked out of the oil riches but heavily placated with religio-nationalist rhetoric. US accusations that Iran cannot be allowed nuclear technology hinge on two hypotheticals; that Iran will either wantonly, or inadvertently, loose nuclear material onto the black-market and/or its enemies. Speaking to the question of reason, what many in the western popular narrative don’t understand is nukes leave a fall-out signature traceable to the source technology; a fingerprint. If one went off, fissile or radiological, Iran would be identified as the harbinger and annihilated, with the US penchant for unilateralism. And Iran is no doubt very clear on this technological reality. As for nuke secrets being sold off to the highest bidder, state or non-state, the firm hand Iran keeps on its domestic power structures would render that unlikely. In fact, it was the existing 'Muslim nuke' state, Pakistan, that suffered such an embarrassment in the incident of AQ Kahn, the Pakistani nuclear scientist who tried to leak sensitive information. The same country whose intelligence service, the ISI, is also heavily fractured with Islamist sympathizers, and which was ostensibly hiding Osama bin Laden a mere mile or two from the national military academy. Furthermore, it is Saudi Arabia which has been buying nuclear technology and reportedly has a standing agreement with Pakistan to obtain a nuke at will, and with whom the GCC states spend 13-times more on weaponry than Iran. Yet those obsessed with the issue see a relatively stable, realist, and deeply conservative Iran as the nuclear threat, not Pakistan and partner Saudi Arabia. Braced against this argument, the common retort is that Iran’s belligerence is evidenced by Ahmadinejad’s call to “wipe Israel off the map.” This citation fails to consider two things. One, Ahmadinejad never made that comment. It was a mistranslation. Though admittedly, after hitting the western press, the regime took advantage of a hysteria they didn’t start, and coopted the message for internal use within Iran for nationalist reasons. Leading to two: Ahmadinejad was struggling for something to distract from the flagging economy under his administration, even falling out with Khamenei. And his signature firebrand behavior was key to the plausibility of this statement. In reality Israel’s rise has not traditionally been a Shi’a-Persian battle-cry, the Palestinian people being Sunni-Arab. Latter day Iranian calls to action have been more about Iran coopting the raison d'etre of modern Ummah identity, in competition with their Sunni-Arab rivals in Saudi Arabia, land of the Two Holy Mosques, for sectarian and political superiority; those two things being inextricable in the age-old Sunni-Shi’a conflict. The value of Iranian adventurism in Yemen has been to create a clear existential threat to the Saudi regime and its Gulf partners, leading to the Arab defense force, an Arab version of the NATO Response Force, and for the first time generally Sunni. This common threat led to calls from Saudi Arabia for Pakistan to join an attack on Iran in what looked like a rampant escalation. But sharing a permeable border with Iran, the Pakistan parliament declined. Saudi Arabia quickly followed up with public declarations that they were not in fact at war with Iran, isolating the conflict for now to Yemen. But this echoes the potential for fear-motivated reforms within the Iraqi Army toward similar network-centric goals, and the development of balancing security blocs locally and regionally. Like Obama or hate him, his (and the defense leadership’s) restraint in southwest Asia has been more pragmatic, more conservative, than the conservatives. Another invasion of foreign occupiers will only drive yet more legitimacy to Daesh, and on the slippery slope of foreign intra-state war the west has repeatedly shown incapable of winning. Interfering in regional security can only postpone the inevitable; the dissolution of the balkanized post-colonial federal Iraq into three separate blocs. Short of outright victory, war is fought until equilibrium. Until Sunni-Arab tribes find alternatives to draconian Daesh rule, this will be the vehicle to express their nationalist ambitions. More sectarian occupation will not win over ethno-religiously fueled homeland defense. The current incarnation can be pushed west, perhaps even out of the cities of Ramadi, Mosul, etc., relegating the movement a provincial one. There it can be contained until it evolves, with Ba’athists tempering their expansionist ambitions, and tribal leaders unwilling to take orders from outsiders forever or give up simple luxuries like a mere cigarette. Containment has worked for the west before. Having been fully illustrated over the past decade that we cannot landscape the world into something more to our liking, containment will once again be the most pragmatic tool. To do so, regional competencies will have to be groomed. Shi’a-Baghdad and the IA must simply take on the task of reform or die, just as the Sunni-Arab defense force must learn to organize a regional security bloc worthy of the threat of Iranian incursion on the peninsula. The west should get used to Iran taking a stronger lead in the region, balanced against a robust Sunni-Arab alliance. The nuclear deal with Tehran will help solidify that future, as Iran is eager for sanctions to be lifted and the taps to start running again (Ali Khamenei himself, as the head of the Iran oil regime, reportedly being worth over $60 billion—more including real estate). Car bombs (VBIEDs) have been called the poor man’s airpower, for wreaking similar targeted destruction and terror. Remove the coalition air campaign and Daesh will continue with VBIEDs. Continuing the air campaign at least maintains a kind of parity. Airpower won’t be the deciding factor for victory, but losing it will decide defeat. The light boot-print of current airpower and facilitating the training of IA is not the least the US can do. It’s everything the US can realistically do.